Beach time. Bocce ball. Five o'clock happy hour. Tuesday night Bingo. 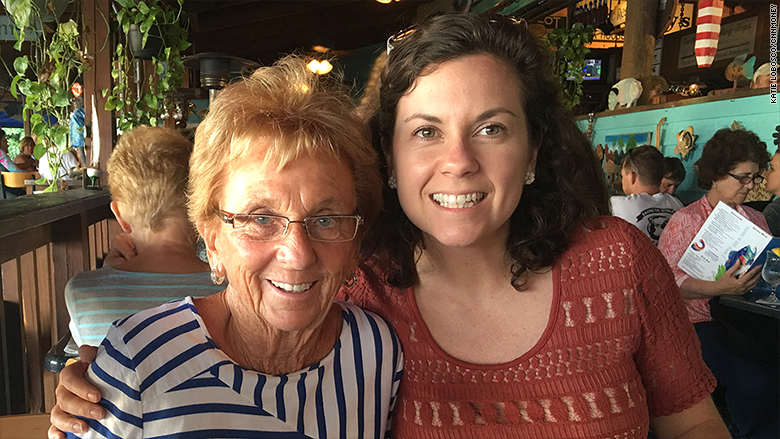 When I visited my Grandma last winter in Florida, I got a taste of what retirement life is like. Her day-to-day sounds relaxing, but the woman rarely sits still. She's going on an Alaskan cruise and road tripping to Nashville this year. But I'm not so sure this is the kind of life I can expect in retirement, too. Grandma retired at age 65 after working for 33 years as a secretary at the local high school. I remember going to a big banquet in her honor at the time. A plaque she received that night still hangs on her wall at home. Since then, she's lived off her pension, my late Grandfather's pension, Social Security, and some savings she invested. I won't be getting a pension, let alone two, and I won't be able to get my full Social Security benefits as early as Grandma did. There's a chance I won't receive as much. I'll be relying on my own savings -- big time. When she quit her 9-to-5 gig, she also gave up side jobs like selling tickets at the school's football games. She didn't have to work again to afford her comfortable lifestyle. Financial Adviser Douglas Boneparth told me, in so many words, not to expect the same kind of retirement. "Affording not to work entirely might not be an option for our generation," he said. In fact, he doesn't expect a lot of Baby Boomers will be able to quit work entirely right away. My Grandparents weren't rich, but they were able to own one house and a condo, send two daughters to college, and put some money away for retirement as well. "It's much more challenging for Millennials," Boneparth said. Almost 70% of college grads now leave school with some student debt. (I did, but my Grandma didn't.) Just 14% of private sector workers receive pensions now, compared to more than 30% a few decades ago. Plus, we're expected to live longer. I graduated in 2009, when unemployment was high and wages would remain stagnant for the next six years. I didn't start saving for retirement until I was 27. Grandma told me she didn't start saving money for retirement until about 10 years into her job either. But she didn't have to fund her full retirement. Comparing my financial situation to her's was making me lose hope that I'd ever be able to stop working. But according to an analysis I ran using an online calculator, I should be able to retire comfortably at age 70 if I keep saving at the same rate I do now. That's based on things like my income and how much I've saved so far. Considering that's just five years later than Grandma, I'm feeling better already. But that conclusion is also based on a bunch of assumptions, like the future rate of return on my investments and how much money I'll actually need. Those are hard to predict when retirement is more than 35 years away. When I first ran my analysis, I expected a 5% annual rate of return from my investments. This is a conservative guess compared to historical results, which point to a return between 6% and 7%. But some analyst reports, including this recent one from McKinsey, say investors should expect a lower return over the next 30 years. No one, of course, can predict the market. "I'd like to borrow the crystal ball they're using," Boneparth said. Last year, I earned about 4% on my investments. If I assume that's the rate of return I'll get over the next 35 years, I wouldn't be able to retire until six years later -- at the age of 76. If I earn 6%, though, I'd be able to retire at 69. But if Congress does nothing to fund Social Security sufficiently, its trust fund is set to be tapped out by 2034, long before I retire. That means it will only have enough revenue to pay 79% of promised benefits. Things could certainly change before then, but I decided to see what kind of impact this would have on my retirement. I was surprised to see how significantly I'd be set back. If I only receive 79% of my promised benefit, it could delay my retirement by another six years. This is hard to guess. The rule of thumb is that you'll need between 70% and 80% of your pre-retirement income each year. So if you were earning $100,000 a year before you retired, you'd want to have between $70,000 and $80,000 a year in retirement. Vanguard's calculator suggests I'll need about 77%, based on my current income. I could have that amount if I retire at age 70. If I want to have 85% of my pre-retirement income, I'd have to work until age 76. Right now I set aside 13% of my income each year for retirement. But I plan on contributing more than that in the future. If I wanted to replace more of my income, I could start saving 21% now and retire at 67 with 85% of my pre-retirement income. If I believe Social Security will be reduced, I could start saving 19% of my income now and still be able to retire by 70. And, as Boneparth suggested, I could keep working part-time after my official retirement date to help fill in a potential gap in my finances. "I know it's harder today, but you're going to be OK. Look at the glass half-full, not empty, Kate," Grandma told me. CNNMoney would like to hear from you. What Millennial money problems stress you out? Are there personal finance questions you can't find the answer to by Googling? Email Katie.Lobosco@cnn.com.